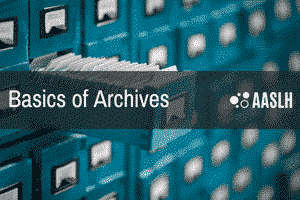 Basics of Archives is an AASLH Continuing Education online course July 1 – July 26, 2019 hosted in the online classroom. This online course is about caring for historical records. This online course is taught by Charles Arp. The recently revised Basics of Archives online course is designed to give organizations and individuals who are responsible for the care of historical records an introduction to the core aspects of managing and protecting historical records collections, using appropriate principles and best practices. LENGTH: 4 weeks; 15-20 hours to be completed anytime during the four-week course period (dates above). PARTICIPATION STYLE: Online chat. There are no required times to be online. GRADING: Pass/Fail. You must complete all exams within the allotted four weeks in order to pass the course. The newly revised Basics of Archives online course is designed to give organizations and individuals who are responsible for the care of historical records an introduction to the core aspects of managing and protecting historical records collections, using appropriate principles and best practices. This course is a beginning level course designed for professional staff and volunteers of historical organizations and libraries with historical collections who have little to no experience with archival materials. Charlie Arp has a BA and MA in history from Ohio University where he specialized in archival studies. From 1991 to 2003 he worked at the Ohio Historical Society (OHS) where he held a variety of positions including archival processor, reference archivist, Head of Reference, Assistant State Archivist and State Archivist. As Assistant State Archivist he was the digital projects coordinator and he formed and chaired the Ohio Electronic Records Committee, an interdisciplinary group formed to draft electronic records policy, guidelines, and best practices for state and local governments in Ohio. As State Archivist he was a senior level manager responsible for the planning, coordination, and administration of the operations of the State Archives including the Local Government Records program and the Youngstown Historical Center of Industry and Labor Archives/Library. In 2003 Charlie was hired by the Battelle Memorial Institute as Enterprise Content Manager. At Battelle Charlie pioneered managing electronic records in lieu of paper records. Charlie also supervised the Good Laboratory Practices (GLP) archives. GLP records fall under FDA regulations to ensure that the records documenting scientific research for substances put in or on humans are created reliably and maintained authentically over time. In 2015 Charlie tested and validated the use of an electronic management program to enable Battelle to create, manage, preserve and use electronic records as part of submissions to the FDA. In early 2016 Charlie accepted an offer for early retirement from Battelle. Since then he has started an archival and records management consulting firm and is writing a book on archives.